Home » Altcoins » What is EOS (EOS) Coin? DAPPs platform with bright future or long-lasting scam ICO? What is EOS (EOS) Coin? DAPPs platform with bright future or long-lasting scam ICO? EOS is a blockchain-based technology similar to Ethereum which has been raising quite a few eyebrows since its development company, block.one, launched the EOS ICO back in June 26, 2017. Its similarity and relation to Ethereum has been an important part of its identity and development, which you will note throughout this article. One of the brainchildren of this project is Dan Larimer, who is known around the crypto world for his previous successful dealings with decentralized projects such as Bitshares and Steem.it. Called by some ‘the Ethereum killer’, EOS is envisioned as a platform that will have the ability to handle massive numbers of transactions, process payments differently and host tools which will help developers create decentralized apps (DAPPS). 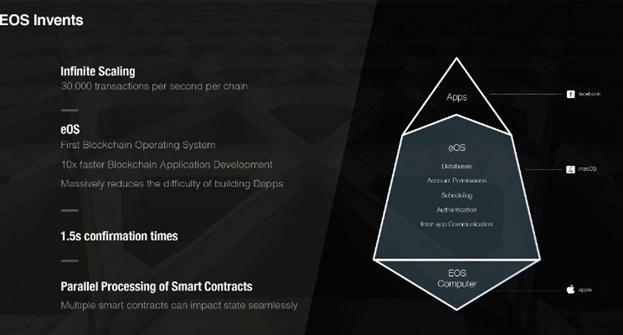 EOS is decentralized open source software designed to deploy high performance Blockchain apps based on the Smart Contract technology. Smart contracts allow users to transfer and exchange money or properties in a transparent way, while avoiding the services of a middleman. Smart contract, much like a traditional contract, defines all of the obligations and potential penalties involved in an agreement. The difference from a normal legal contract is that the smart contract platform also automatically enforces all of these obligations and penalties (whereas obligations and penalties in normal contracts are enforced by a representative of the law). In practice this means that developers can use the EOS platform to build applications which will be fast, easy to use and capable to outperform their centralized competition. Existing single-threaded blockchain platforms are burdened by large fees and limited computational capacity which prevent widespread blockchain technology adoption. Ethereum for example does a very poor job of making interacting with their blockchain a user-friendly process, as it requires you to first design your app and then translate it into Ethereums complicated machine code called Solidity. 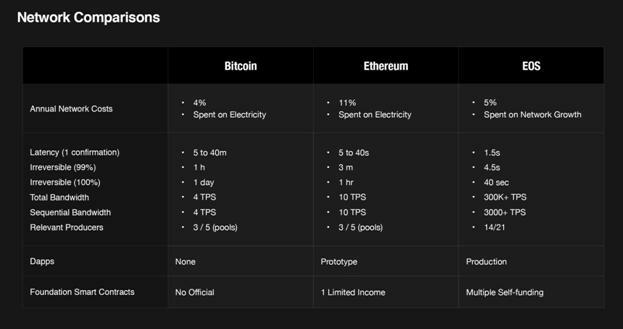 The Ethereum network is designed as a neutral platform which basically has “no features”, refusing to add even the most often used protocols which are considered industry “standard”. This reduces bloat among applications, but it also results in a loss of efficiency for app developers. It also further complicates the process by demanding users/developers to pay a so called “gas” fee for every transaction and every interaction with the network. Businesses such as Facebook, Ebay, Uber and AirBnB require blockchain technology capable of handling tens of millions of active daily users. In certain cases, applications may not work unless a critical mass of users is reached. Application developers need the flexibility to offer users free services; users should not have to pay in order to use the platform. A blockchain platform that is free to use for users will likely gain more widespread adoption. Developers and businesses can then create effective monetization strategies. All records of the application’s operation must be stored on a public and decentralized blockchain to avoid issues with centralization. Validators(miners) of the blockchain should be incentivized with ability to earn cryptographic tokens by validating blocks. Businesses building blockchain based applications need to be able to upgrade their applications with new features. Also, all software is bound to suffer from bugs, regardless of how well it was coded. The platform must be robust enough to fix bugs when they inevitably occur. Good user experience demands reliable feedback with delays of no more than a few seconds. Longer delays frustrate users and make applications built on a blockchain less competitive with existing non-blockchain alternatives. There are some applications that just cannot be implemented with parallel algorithms due to sequentially dependent steps. Applications such as exchanges need enough sequential performance to handle high volumes and therefore a platform with fast sequential performance is required. The application community must agree on a cryptographic algorithm to show proof of value. For example, Bitcoin uses Proof of Work (PoW) and Ethereum is currently using PoW with plans for a hybrid PoW/Proof of Stake (PoS) in the future. According to the EOS website, their software is the perfect solution to abovementioned needs as it provides accounts, authentication, databases, asynchronous communication and the scheduling of applications across multiple CPU cores and/or clusters required to scale to millions of transactions per second, eliminate user fees and perform quick and easy deployment of decentralized applications (DAPP-s). In contrast to the Ethereum approach, EOS provides a certain amount of standardization by including some most commonly used functions in the default platform, such as implementations of the cryptography and app/blockchain communication tools needed by many applications. EOS introduces generalized role-based permissions, a web toolkit for interface development, self-describing interfaces, self-describing database schemes, and a declarative permission scheme. The applications running on this decentralized OS will be able to communicate with each other while being protected by strong security measures. These applications will also be able to share frameworks and libraries which will make development faster, more secure and less complicated. One of the most often cited problems with Blockchain networks is the issue of scalability. Scalability is the make-or break area which can determine if an app is commercially viable or not. Currently, the Ethereum network is limited by the single threaded performance of a CPU. In fairly optimized conditions the Ethereum network runs an average of 25 transactions per second, with hypothetical ultimate optimization bringing that number up to 50 or 100 tx/s with optimizations. However, under load from real applications, the averages of the Ethereum network plummet to 10 tx/s or less. 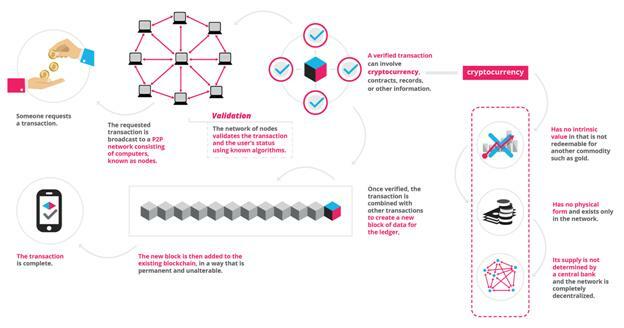 In the past, the network has been overwhelmed and overloaded with transactions to the point that all but the highest-fee transactions were rejected. This was especially obvious during recent Initial Coin Offerings (Status ICO comws to mind), during which the network was completely overwhelmed and the ETH tokens suffered a massive flash crash. 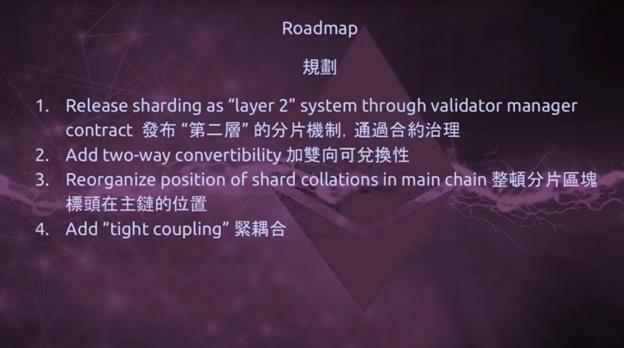 To solve these issues Vitalik Buterin, the creator of Ethereum, has laid out a roadmap to “unlimited scalability” which introduces a concept called “sharding”. Following this roadmap will eventually result in a more complex, robust network which will bring about the birth of Ethereum 2.0. 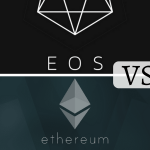 However, in terms of scalability, EOS will have two significant advantages over the Ethereum network. First, EOS will rely on Graphene technology, which has apparently performed admirably in stress tests, achieving up to 10,000-100,000 transactions per second. Secondly, EOS will use parallelization to scale the network. This introduces horizontal scalability into the blockchain and could potentially allow up to millions of transactions per second. Once fully operational, EOS should be the first network able to support truly commercial scale DAPPs. The Ethereum network is (in)famous for its gas fees which you have to pay in exchange for every calculation, storage operation and bandwidth utilization. These fees fluctuate to sometimes unbearable highs as miners prefer to select transactions with larger fees. After all, a miner is an important part of the network and he is mining for profit, so he will look to earn as much as possible from each operation. This problem culminated during an ICO for the Status coin, where fees went up to 100 dollars. Even the smallest of transactions required fees which almost equaled the value of the transaction itself. This creates a scenario where rich transactors can potentially freeze the entire network by flooding it with high-fee transactions. Furthermore, this model requires developers and startups to continuously burn gas fees throughout development and deployment of their applications. In contrast, EOS will utilize an ownership model, in which holding EOS tokens gives users a proportional share in server resources. This means that if you own 1% of the entire EOS token supply, you will have access to 1% of the network bandwidth, regardless of the load on the rest of the network. In this way, smaller startups and developers can invest their scarce funds into purchasing a small part of the network. This way they will receive a predictable amount of network bandwidth and computing power while having an option to simply purchase more EOS tokens when they need to scale up their applications. Furthermore, since the network will have zero transaction fees, there is no network development cost, except for the initial purchase of EOS tokens. However, these can of course always be sold in order to reclaim the initial investment if desire. Now all of this sounds extremely promising but it is important to note one tiny little detail: THE EOS SOFTWARE DOESN’T EVEN EXIST (yet). EOS software is still in development and the people behind the project claim that the basis for the technology have already been developed and tested through Steem.it (a decentralized social network functioning as a veritable blockchain explorer) and Bitshares (a decentralized exchange). It is now up to Dan Larimer and his development team to deliver on what could be a revolutionary new platform. Upon announcing EOS to the world, block.one also announced how it plans to fund this new ambitious project. The funding will be done via an ICO of ERC-20 tokens which started on June 26, 2017 and will last exactly one year(ERC stands for Ethereum Request for Comments, this is an official protocol for proposing improvements to the Ethereum network; ’20’ is the unique proposal ID number). 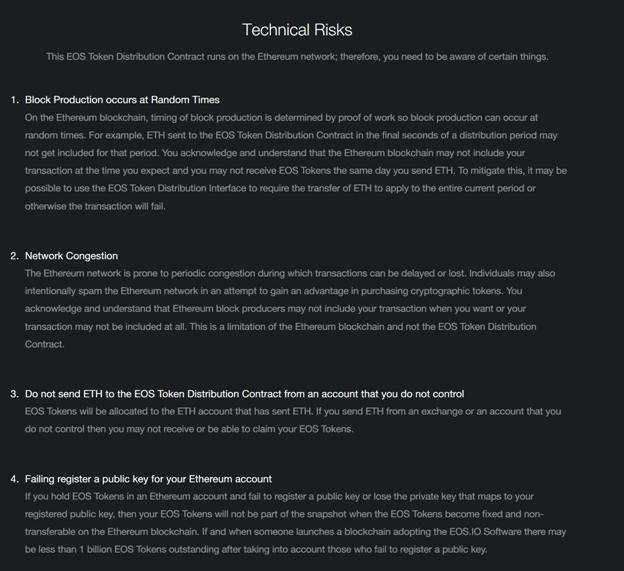 ERC-20 protocol defines a common list of rules for all Ethereum tokens to follow, meaning that this particular token empowers developers of all types to accurately predict how new tokens will function within the larger Ethereum system. The token value is arbitrarily determined by the development team. When the token gets listed on an exchange, the value will then become corrected thanks to the price dynamics and simple laws of supply/demand. While new coin being produced will dilute the pool and lower the price, upcoming news and launches from the block.one will result in the price going up. The eventual value will be settled by the participants of the network and not by some centralized entity. All things considered, EOS has the potential to achieve a market cap that could surpass even Bitcoin. 200,000,000 EOS Tokens (20% of the total amount of EOS Tokens to be distributed) will be distributed during a 5 day period beginning on June 26, 2017 at 13:00 UTC and ending on July 1, 2017 at 12:59:59 UTC (the “First Period”). 700,000,000 EOS Tokens (70% of the total amount of EOS Tokens to be distributed) will then be split evenly into 350 consecutive 23 hour periods of 2,000,000 EOS tokens each beginning on July 1, 2017 at 13:00:00 UTC. 100,000,000 EOS (10% of the total amount of EOS Tokens to be distributed) will be reserved for block.one and cannot be traded or transferred on the Ethereum network. At the end of the 5 day period and at the end of each 23 hour period referred to above, the respective set number of EOS Tokens set forth above will be distributed pro rata amongst all authorized purchasers, based on the total ether (“ETH”) contributed during those periods. It is important to note that EOS’ ERC-20 tokens are being created via the Ethereum platform. Therefore if you wish to purchase these EOS tokens you will need to have some Ethereum in your wallet. For the full list of instructions on how to buy your own EOS, visit this link. The Block.one website also claims that EOS tokens you purchase won’t give you any rights or features on any new software that gets created on the EOS platform. EOS tokens so far only serve to fund the project/help you stake a claim on server resources. They are currently useful only to interested developers who need to have EOS coins to gain access to the EOS blockchain. Developers do not need to spend EOS coins to use the server resources; they just need to prove that they hold them. As a developer building a new app on the EOS network, you will need to secure a number of EOS tokens, either by ‘renting’ or buying them. This is one potential monetization approach for the average user, pooling tokens and renting them to application developers. EOS will allow developers to create blockchain applications with which end users will interact easier than ever before. EOS will have support for creation of ERC20-like tokens; this means that future blockchain based apps will be able to host their own ICOS. It is unclear if there will be any larger use for the EOS tokens in the future. Currently it is possible to transfer EOS Tokens on a peer-to-peer basis or on platforms operated by 3rd parties during the EOS Token distribution period. According to block.one, EOS Tokens will become fixed (non-transferable) on the Ethereum blockchain within 23 hours after the end of the final EOS Token distribution period which will occur on June 1, 2018 at 22:59:59 UTC. Notably, there are a couple of mostly economic issues with the EOS tokens and the project itself. Right now the token value is somewhat non-volatile. 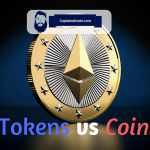 The question is what happens when/if larger quantities of tokens become available on the market? Will large holders dump the tokens on the market and cause the EOS token price to crash? Will block.one start buying coins, artificially increase their value and then dump them on the market? Keep in mind that they are probably the highest “holder” of EOS tokens at the moment, as they plan on keeping 10 percent of the entire ICO for themselves. To their credit, block.one announced on their website that they intend to engage an independent third party auditor who will release an audit report which will provide assurances that block.one has not purchased EOS Tokens during the EOS Token distribution period or traded EOS Tokens (including using proceeds from the EOS Token distribution for these purposes). This report will be made available to the public on the eos.io website. Another issue is that there is no cap on the amount of funds that block.one wishes to accumulate with this ICO. How will the excess funds be managed? The company claims that some funds will be used for general administration and operating expenses, as well as for building a blockchain consulting business. Finally, Dan Larimer has a history of moving on to the next project, as he did so with Steem and Bitshares. This is not necessarily a bad thing, but if the timing is not right it could send wrong signals across the market and the project could suffer. Here is our list of best ripple wallets.